Useful at home or outside. DescriptionThis discreet light and natural coloured Welcome Family booster seat is fast and easy to fit to a chair and easy to store away after use too. · Folds down to an A3 format. 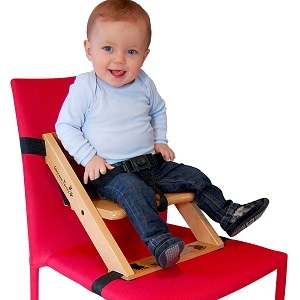 Suitable for 6 month old babies to 3 year old toddlers (child needs to sit unsupported). Maximum child weight: 20 kg. DimensionsSize: 41 x 29 x 5 cm. International recognized brand products, always delivered in excellent condition. Each product is carefully sanitized between each rental. Delivery and collection 7/7, from 7:00 am till 9:00 pm. Delivery and collection on appointment, within a 1h time range (Paris area). Fixed delivery and collection fees: 20 € for Paris and surroundings (extra fees apply for CDG and Orly airports, Eurodisney). Delivery and collection fees offered for any booking above 120 € (Paris area). Need to rent baby items for more than 1 month? Contact us for a specific quote. We've chosen this wooden booster seat because it is very easy to use (1 minute installation time). It folds flat to make it easy to store when not in use or to carry it when going to restaurant. Renting this wooden booster will allow you and your child to enjoy family meals when at home or outside. As for all our products, we do deliver this booster seat to your address, on appointment and will show you how to install it. This product is new in our range of baby equipment rentals. We thus don't have customers comment to share with you yet. Toys - 6 mths - 3 y.o. We recommend our customers to use the latest browser versions of Chrome 30+, Mozilla Firefox 27+, Microsoft Internet 11+, Safari 7+ for better performance and security.